“Would you rather?” is the ultimate car ride game. Obviously, there is no good answer to either of these questions. 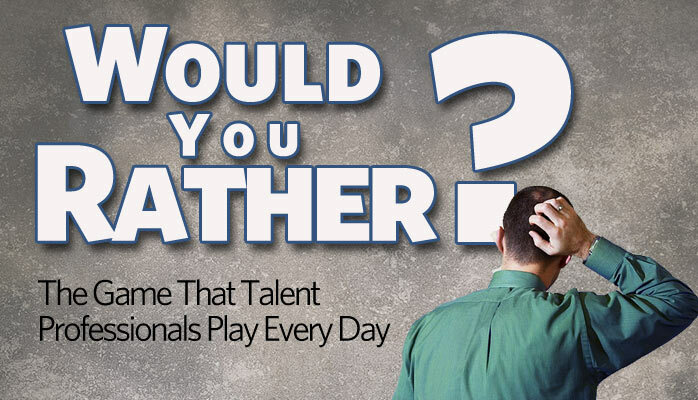 We took “Would you rather?” a step further and made it very real for talent acquisition professionals. Brace yourself—it’s time to make some difficult decisions. Would you rather have an ad that says, “We’re a great place to work” or a site that ranks for “great place to work”? Would you rather get people excited about your company in a 20-word ad or in an 800-word article? Would you rather draw attention to your company with your logo or with an authentic human story? Would you rather push your ad at people or have them search to find your content? Would you rather search for an ad or search for a story? Would you rather watch the commercial or the show? Would you rather have your message about how great you are at the top of Google’s search results for free or because you paid for it? Would you rather have people lean in to learn more about you or lean back and wait for the ad to end? Would you rather have a thousand candidates who would apply to any opening or a dozen candidates who were incredibly selective about where they applied? Would you rather interrupt people or be a destination for people’s questions? Would you rather tell people how exciting your company is or show them how exciting your company is? Would you rather have everyone think you only speak in “HR-ese” or be open and transparent about who you are and why people choose to work for you? Would you rather treat prospects like children or like your most valuable customers? Unlike the car ride game, these choices aren’t really equal, but they do reflect the choices you are making every day at work. And these choices have dramatically different outcomes! Some choices lead you to hire more “pretty good” candidates (that won’t change the direction of your company), while others lead you to assemble an army of game-changers that will produce great work. So what will it be? Would you rather have “average” or an army? Either way, the choice is yours. This post was originally published at LinkedIn.